Custom made Prince with crown Baby Onesie, Burpcloth, & Bib Gift Sets make adorable & unique baby gifts. They can be given to reveal a pregnancy, reveal baby's gender, a cute baby shower gift, a special occasion or just for fun. This listing is for 1 Prince with crown custom matching onesie, burpcloth and bib. 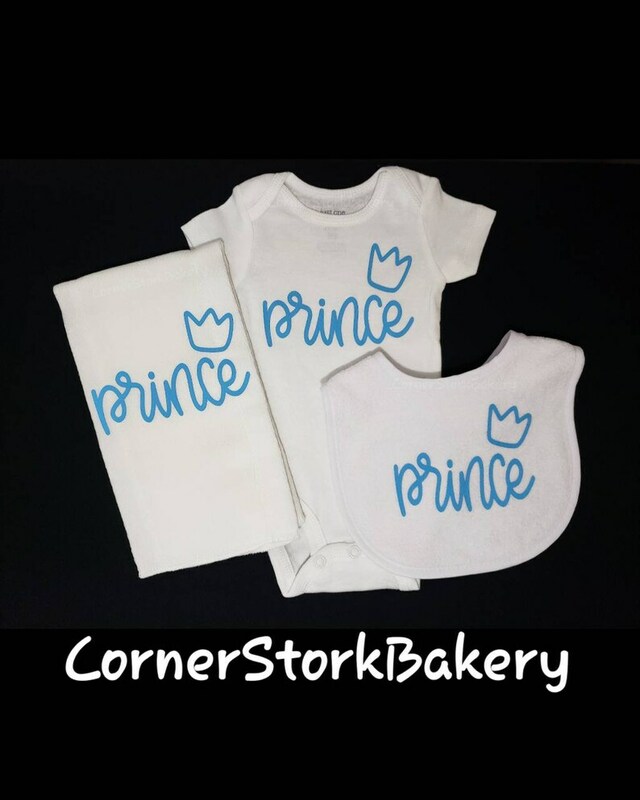 • 1 short sleeve Prince with crown white Onesie with design made with htv vinyl (this is the primary color of choice). • 1 white velcro Bib with matching phrase in the same htv color. • 1 white Burpcloth with matching phrase in the same htv color. Can be made in long sleeves or other designs per request. Maybe, looking for a Princess gift set instead? We can definitely make it. Prices may vary. Send me a message and we can get your order started.